February | 2011 | Stand Up and Speak Out! 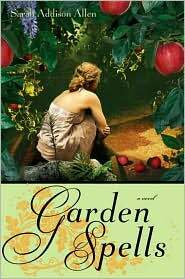 I’d first heard about Sarah Addison Allen at work when her first book, Garden Spells, became the company’s handsell for six weeks. I didn’t actually read the book then,* despite how much a coworker said I would love it. 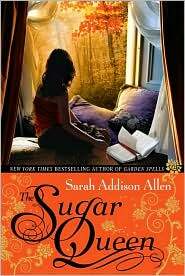 It wasn’t until a few years later when my roommate Jackie brought home Allen’s second book, The Sugar Queen, from the library. She was quickly infatuated with the writing and urged me to read it. Her excitement was catching so I thought I would give it a shot. From that day on, I didn’t look back. The Sugar Queen is about Josey, a lonely woman living with her mother in Bald Slope, North Carolina. She feels obligated to help her mother to make up for being such a terrible and spoiled child. They go about their days in routine until one day Josey wakes to find a strange woman has taken up residence in her closet. This woman’s appearance shakes up Josey’s routine and sends her on errands outside her comfort zone. But soon her reclusive life becomes less so as she starts meeting people and making friends. One friend she meets is Chloe, who, since she was little, has books appear to her when she needs them. After she kicks her boyfriend out of their place, a book called Finding Forgiveness appears. She ignores it, but it continues to stalk her, showing up at various points in her apartment, her workplace, and even at a bar. Chloe was the first reason I loved The Sugar Queen so much. Who wouldn’t want books to magically appear to them whenever they needed them? The second reason was the writing. Allen’s words draw the reader in quickly and doesn’t let them go, even after the book is finished. I don’t stop thinking about the book until long after I’ve finished it, which is a rarity for me. Typically, I just move on to the next book. I also liked the way the book ended (don’t worry, I won’t say what happens). There’s a little twist at the end, one I didn’t see coming on the first read-through. But the reason why I like the ending overall is because everything is just right. There aren’t any loose ends dangling, or questions left unanswered. It all comes together neatly by the last page. After having such a fun time with The Sugar Queen, Jackie and I decided we needed to read her first book, Garden Spells. 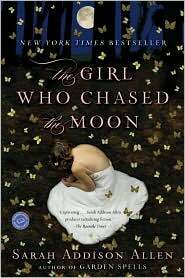 In this book, Claire Waverly gets the shock of a lifetime when her sister Sydney comes home after a decade on the road. With her is her daughter, Bay, who has the uncanny ability to know where things belong, like silverware or people. While Sydney tries to leave behind her abusive past, Claire attempts to thwart the desires of her new neighbor with food. See, the Waverly garden is a magical one. Or, at least, the Waverlys know which herbs and flowers bring out certain attributes in people when eating food made with them. For example, the honeysuckle wine helps the drinker see in the dark, though it can reveal other things as well. Also in the garden is an apple tree, which will actually throw apples at people, trying to get them to eat the fruit. The Waverlys never eat the apples and always bury the ones that get thrown. They don’t eat the apples because it is believed that the consumer of an apple from that tree will see the greatest event of her life. As Claire tells Bay, if it’s a good event, then you have to live your life knowing that nothing else will ever make you as happy. If it’s a bad event, you have to live your life knowing that something awful is on the horizon. As with The Sugar Queen, Allen’s writing in Garden Spells is enchanting. The plot is quirky and the characters are intriguing. 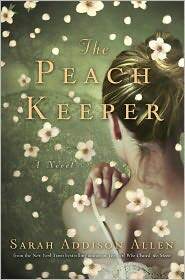 Next month, The Peach Keeper will be released. I know little about it but I know that, like Allen’s other books, it is a book I want to own in hardcover. Allen’s books are ones worth owning because one will want to go back to them time and time again. They have a magical and mesmerizing pull on the reader that will demand attention multiple times. Second, third, and even fourth read-throughs are a must. *Previous handsells we had didn’t seem up my ally so I was slower to jump on board and read them. 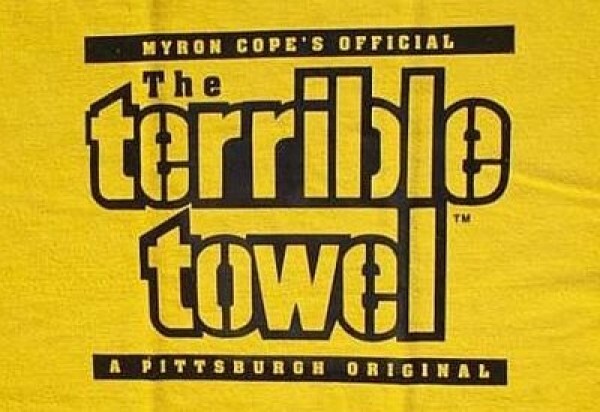 Once again, we have arrived at Super Bowl Sunday and, once again, the Steelers are in position to take the cake. Speaking of cake, I thought it would be fun to make one to share with Fred and his parents as we watched the big game together. Fred and I will be cheering for the Steelers since my entire family requires it* and since our beloved Colts aren’t playing. So, what better way to cheer them on than to have a cake to look like the Terrible Towel? Before I even started I knew that my (lack of) artist skills would have some effect on the cake. So I figured that I wouldn’t have the font exactly down, nor all the tiny writing but the basics I could get. At the store I picked up mix of chocolate cake, along with cream cheese frosting and some black decorative frosting. I had yellow dye at home so I could get the yellow just right. After baking the cake, I let it cool in the kitchen while I napped. When I woke up for lunch, I discovered that my cat had decided to take a bit of a taste of the cake. Of course, she had to try some, not on the corner that would be easy to cut off, but about four inches in from the side. Unwilling to waste the good 2/3 of the cake (and not really wanting to make another one), I cut off the bad part and proceeded to frost. Not having a full-size cake really hurt the production value, as you will soon see. 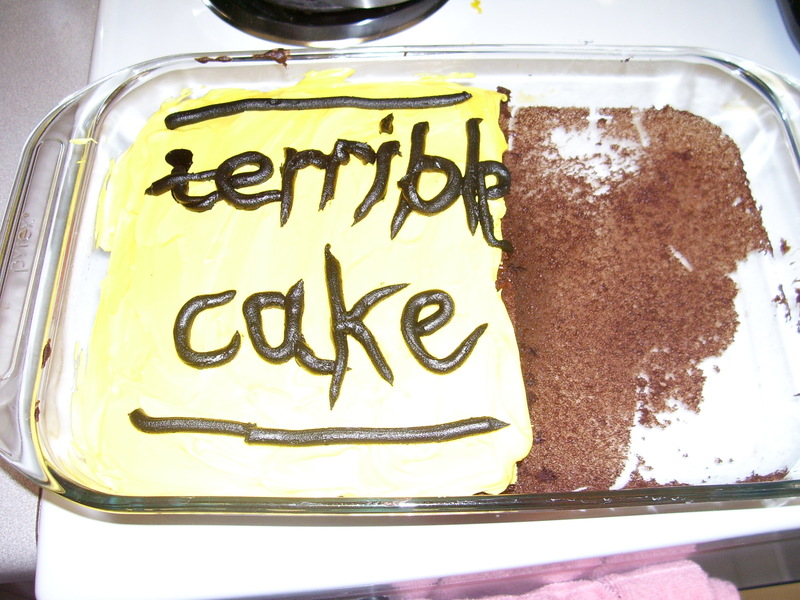 And it truly is a terrible cake!